New Orleans Jazz Funerals are public burial services for prominent community members; traditionally African American males. After the funeral service, a procession of musicians, funeral directors, family, and friends moves from the site of the funeral to the cemetery while marching to the beat of a brass band. Courtesy of Louisiana State Museum. 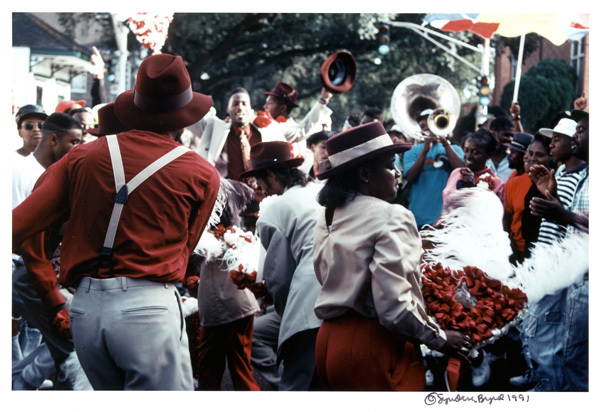 A color reproduction of a 1991 photograph by Syndey Byrd of a second line parade. New Orleans is a city of parades, most famously the Mardi Gras processions that roll down the wide boulevards of St. Charles Avenue and Canal Street during Carnival season, but in all the seasons and in every neighborhood there are jazz funerals and parades known as second lines that fill the backstreets with a joyful noise. On Sunday afternoons from September through May, African American forms of music, dance, and dress are put on display in parades that have become symbolic of New Orleans and its association with festivity and pleasure. The upbeat tone of second line parades originates in the distinctive local tradition of jazz funerals. Though funerals would seem an unlikely source for such a festive tradition, the jazz funeral celebrates life at the moment of death—a concept common among many cultures until the twentieth century. In New Orleans and elsewhere, Europeans and Anglo-Americans attended funerals with music that featured a brass band playing “solemn music on the way to the grave and happy music on the return.” There is also a history of rejoicing at death through music in West African burial traditions. In 1819, architect Benjamin Latrobe witnessed a continuance of this tradition at a black funeral in New Orleans. The funeral began with the mourners making “loud lamentations” and ended with “noise and laughter.” With the end of slavery, black funerals with brass bands became commonplace. By the beginning of the twentieth century, the funerals had become forums for the performance of a new style of music—jazz—eventually becoming known as jazz funerals. Simultaneously, the popularity of funerals with brass band music waned among white New Orleanians. In the traditional jazz funeral, a prominent member of the community—often a musician and nearly always a black male—is “buried with music.” Benevolent and burial societies traditionally arranged these funerals, often offering the services of a brass band for an extra fee. The societies collected dues throughout the year to pay for members’ health care and burial costs. The musicians, funeral directors, family, and friends of the dead make up what is called the first or main line, while the crowd marching behind is collectively known as the second line. As the procession moves from the funeral service to the burial site, the first and second lines march to the beat of a brass band. At the beginning, the band plays dirges, somber Christian hymns performed at a slow walking tempo. 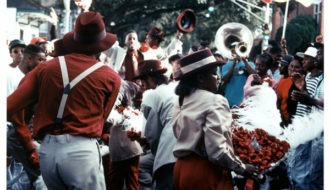 After the body is laid to rest, or “cut loose,” the band starts playing up-tempo music, the second liners begin dancing, and the funeral transforms into a street celebration. At some point in the late nineteenth century, the second line detached from the jazz funeral and developed its own identity. Organized by social aid and pleasure clubs, second lines wind through the neighborhoods of club members, making designated stops at their houses and other significant neighborhood sites, usually barrooms. From September through May, there is at least one parade every Sunday, often held on the anniversary of a club’s founding. Each club hosts fundraisers throughout the year and collects dues at regular meetings in order to pay for police permits, brass bands, and the coordinated outfits that members wear at their parade. 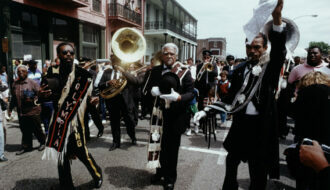 Anthropologist Helen Regis defines a second line parade as a public festival in which club members, musicians, and second liners come together to create “a single flowing movement of people unified by the rhythm.” At the head of the parade, club members wear suits and sashes that display the club’s name, often twirling matching umbrellas above their heads. For approximately four hours, they strut their dance moves in front of the band while the second liners fall in behind and along the side. Many second liners show off popular dance steps such as the high step and the buck jump. Others make their own sounds by singing, clapping, blowing whistles, hitting cowbells and beer bottles, and shaking tambourines. Second line parades create a sense of community among participants, and the public nature of the spectacle makes parading a powerful representation of black New Orleans. This has led to debates among parading organizations and musicians about how parades and funerals should be presented in public. In recent years, the jazz funeral tradition has opened up to include, most notably, young men and women who have died tragically young. At these funerals, the number of dirges performed is drastically reduced, altering the transition from dirges to up-tempo music that is the hallmark of the traditional funeral. Musicians no longer wear the traditional uniform of black band caps, white button-down shirts, and black dress pants, and instead dress in everyday clothes. Some tradition-minded organizations, such as the Black Men of Labor Social Aid & Pleasure Club, bemoan these changes and have sought to perpetuate parading traditions in an orthodox manner. Black Men of Labor organizes funerals for families who want to honor the dead with a traditional burial, and the club sponsors an annual second line parade in which musicians are required to dress in uniform and perform traditional music. The power of parading as a sign of local culture has also brought increased attention from spectators outside the community. Brass bands have made recordings of parade music since the 1940s and toured the globe as representatives of local culture since the 1960s. 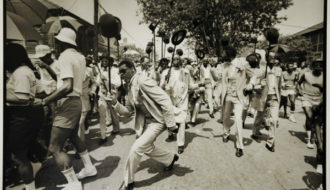 Photographs of community parades, particularly those of Michael P. Smith, began circulating in exhibits and books in the 1970s. 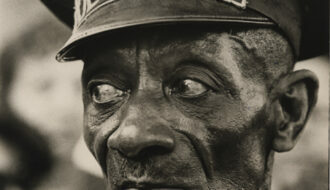 Around this time, bands and second line dancers began to be hired for the entertainment of tourists and others. Today, these staged parades can be seen marching through the grounds of the New Orleans Jazz & Heritage Festival and the lobbies of the Convention Center. The rhythm of community parades may have changed pace, but they have never skipped a beat. 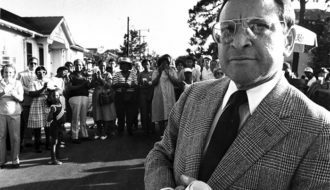 For every staged parade, there is a social aid and pleasure club marching through the backstreets to the whoops and hollers of neighborhood second liners. For every brass band that has been relegated to the halls of history, such as the Olympia or the Eureka, there is a Rebirth Brass Band, Hot 8 or Treme to fill the void in their own way. 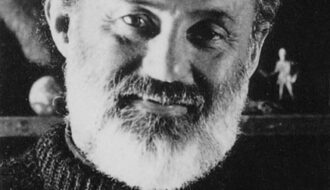 Each jazz funeral begins with a respectful dirge and ends with a cathartic dance. Even in a New Orleans that habitually packages itself as entertainment, the beat of the street remains closely tied to the rhythms of everyday life. Sakakeeny, Matt "Jazz Funerals and Second Line Parades." In https://64parishes.org Encyclopedia of Louisiana, edited by David Johnson. Louisiana Endowment for the Humanities, 2010–. Article published October 2, 2017. https://64parishes.org/entry/jazz-funerals-and-second-line-parades.